This beautiful Broken Arrow cab measures 17.9mm x 25mm x 5.7mm thickness. The WEIGHT 15.6 carats. The stone is thinly backed. 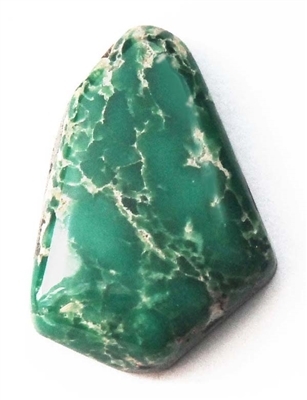 This Natural Variscite comes from a Nevada mine, near Tonopah. Note: The bright white areas are light reflection.